With all that wonderful news about the better than expected economic growth, the OBR’s forecast for wages got a bit lost. The folk at the Resolution Foundation spotted it, though, and put it on these handy graphs. While the OBR’s growth projections were more optimistic than those it came up with in March, its forecast for pay got worse. The OBR doesn’t think average earnings will get back to pre-recession level until sometime in 2017. When you take housing costs into account (the RPI adjusted figure) it’s sometime never. For those on or below the median wage, the situation is even worse. Their pay is forecast to continue falling in real terms for the rest of this decade. There was a lot of excitement (and some bewilderment) last week when the ASHE figures showed that median earnings hadn’t fallen as much as people thought it would. That says a lot about the situation. The median wage only just failing to keep up with inflation is seen as cause for celebration. Last week, the Joseph Rowntree Foundation published a report which painted a similarly gloomy picture. Among its many findings were these. Earnings have fallen across all income groups but the poorest workers have been hit the hardest. Perhaps it’s not surprising, then, that the majority of those households with less than 60 percent of the median income have some family members in work. At the same time, the proportion of workless households in Britain has fallen to an all-time low. Among those households below the official poverty line, the working poor now outnumber the unemployed, retired and sick put together. But low-paid jobs still leave people dependent on benefits. In a report published last week, the National Housing Federation said that an extra 310 working people a day are claiming housing benefit. 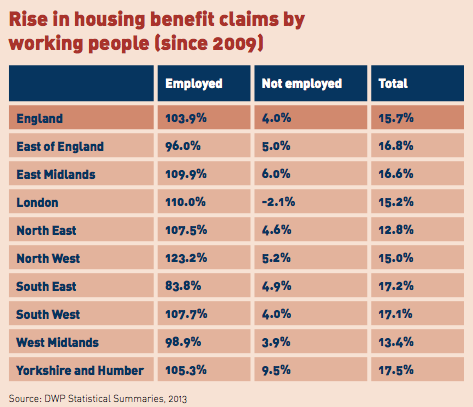 Working claimants have been responsible for most of the increase in housing benefit costs since 2009. Much has been written about people not being able to buy their own homes but a lot of them, now, can not afford to rent either. The picture emerging, then, is not one of the poor being unemployed or ‘on the sick’. An increasing proportion of them are working yet still in need of benefits to get by. And ministers wonder why the welfare bill won’t come down. This chart from the Resolution Foundation’s James Plunkett gives some of the background to all this. It maps wages against GDP and shows the divergence between mean and median wages over time. The ONS Labour Force Survey definition of total compensation includes pensions and employers’ NI contributions. These appear to have kept pace with GDP which suggests that, for those still getting them, employer pensions are holding up pretty well. (There’s more detail on page 15 of this report and in this piece from Ben Chu.) From the end of the 80s, the mean and median wage growth began to fall behind GDP growth and both began to diverge from each other. This suggests that some high earners are pulling up the level of the mean wage. The median wage seems to have become disconnected from the GDP line. After keeping pace with economic growth until the end of the 1980s, the median wage grew at a much slower rate. The projections from the OBR suggest that this trend will continue. So, although economic growth is forecast for the rest of this decade, it looks as though those at the median wage or below won’t see much of it. What is behind the rise of the working poor? As James Plunkett says, it makes for a lousy whodunit. No single factor is to blame. Much as you might want to point the finger at the government, at least some of the evidence shows that these are long-term trends that have been gathering pace for a while. The recession and the stagnation which followed simply gave them a boost. In-work poverty started increasing before the recession and it looks as though it will continue long into the recovery. It seems that our economy and, to be fair, those of a number of other western countries, can no longer create enough jobs that pay well enough to keep people off benefits. The stereotype of the work-shy dole scrounger is out of date. These days, someone poor and on benefits is more likely to come from one of those hardworking families the government keeps telling us about. Working now in the social housing sector gives me a sense of how this is being played out. Social housing is now including as part of its mainstay of providing care and support to society’s vulnerable and providing general needs housing to provising housing for shared ownership or affordable housing. The rhetoric from central government will soon change from talking about the hardworking families as the ones saving the country to the hardworking families being a burden to society just like the feckless and the scroungers. Some surprising facts in here that people need to understand when they listen to the rhetoric of politicians about how they plan to reform welfare to ensure work always pays. It’s a good thing to support the ethic of working for a living … but how much it pays depends on what jobs you can get. 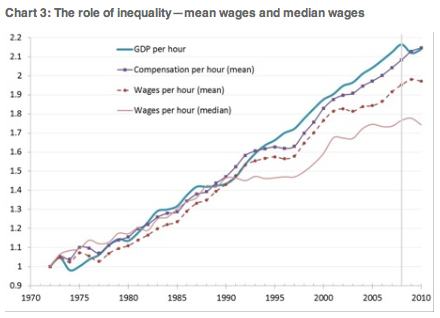 I think the impact of globalisation on wages across the developed world is probably inescapable and that’s part of the underlying cause for the figures we are seeing – the lowest earners being separated from many others in the economy … see the trend from 2004 in your first graph from the Joseph Rowntree Foundation. Society needs to ensure employers are paying their workforce fairly and appropriately so that any welfare component of family income is properly justified and isn’t simply boosting profits for an employer (though we do want employers of all kinds to set up in the UK. I’m coming round to the idea that using the minimum wage, in work benefits and earnings caps or income multiples (top earners compared to lowest paid in each company) might be a way to achieve the balance we need. Given that we exist within a global economy, it was always predictable that the median level of incomes which counts is the global median level of incomes. Is there any research available to show how this has been performing and how it is projected to grow – or decline – in the future? The principal problem – as we have seen from research by the Equality Trust and from what we perceive ourselves on a common sense level, in terms of social cohesion – is the glaring inequality in income levels which stare us all daily in the face. Seeing “hard-working” people working their butts off yet still having to be welfare recipients while – at the same time – we see publicly examples of discretionary spending which verges on the obscene does little to encourage a feeling of us “all being in it together”. To my mind, there is only one way to restore the social democratic consensus that operated in this country in the 1950s and 1960s – and that is to go back to the taxation policies of that era, in which the super-rich were made to pay super-taxes. Some may argue that such a policy risks encouraging wealthy people to leave the UK in pursuit of lower taxation regimes. Well, if it does – it does. Sometimes we have to adopt a principled stance even if in the short term it means we lose out on income tax receipts from some fraction of the super rich and powerful. We got by without the Murdochs of this world before he came along and we can get by again without him too. It is just a matter of political willpower. If the people of this country felt they were living in a fairer and kinder society, then they might just be prepared to accept a modest reduction in living standards in order to benefit in the long run. This is what happened in Germany and explains why their economy is out-performing ours today. I think I’m being a bit dense here – and if so please correct me as I’m genuinely looking for an answer. Housing is, allegedly, a market. So if people can’t afford to pay rents (or buy houses) why aren’t rents (and prices) coming down? Is it because it’s subsidised with welfare ie housing benefit? And if it is, can’t we do something about that? Taking human factors out for the moment, if the government stopped housing benefit tomorrow, presumably rents would decrease to match what people had to pay? And then we wouldn’t have such a welfare/in work welfare issue? yes, I know in practice that it would take time and meanwhile you’d be looking at a lot of human misery as people were ejected from their homes before the market adjusted. But is the theory wrong? (Because if not, it becomes a question of implementation, not idea). It also, I guess, doesn’t solve in-work poverty as such, in that people get less welfare, but spend a similar amount less on rent, so still ahev the same disposable income. But even so, would it help? There is an alternative: rent price controls. They have been used – and worked well – before. Overall, the main problem is lack of supply of housing. However much money benefits people receive to pay their rents has not resulted in any significant increase in the supply of housing. The UK population grew by around 10 million over the last 10 or so years but housing to accommodate them grew by far less. Add to that the fact that more and more people live in single-person homes and it becomes apparent why there is insufficient housing to meet all needs. By introducing rent price controls, the government can bring levels of rents and welfare transfer payments down. This, of course, is only a short-term solution. In the long run, more homes need to be built – and of the right type. Governments in the 1960s prioritized home-building and the amount of housing increased such that the market in homes brought down rent levels naturally. It could happen again now but central government must be committed to increased home building. John Dowdle says “Overall, the main problem is lack of supply of housing”. I’m struck that this is to all intents and purposes an identical statement to “Overall, the main problem is unrestrained mass immigration”, but the two statements indicate quite different political perspectives. The two issues are completely separate. The UK government – if it possesses sufficient political willpower – can do something fairly immediate about increasing the supply of housing to the market. Where ‘unrestrained mass immigration’ is concerned, however, they have far less room for manouevre, particularly where EU immigration is concerned. Of course, they could make life easier for themselves if only they would establish a system for keeping a count on numbers coming into and going out of the country. They keep saying they are going to do this but, so far, there is very little evidence that they are taking the issue seriously. It looks likely that the market in housing will continue to be a failing market situation for decades to come. When, in due course, quantitative easing is abandoned and money market interest rates begin to increase back towards historic levels, this too will make the market fail to function properly even more. -Impact of globalisation and technology which cannot be deterred so in reality there is not much that any government/BoE can do about this. -Impact of high inflation unleashed by BoE the last 5 years on essentials and high housing inflation (rents) unleashed by the low rates of BoE and the constrained supply of houses. Now this is something that any government or the BoE could act upon with the help of LVT + Tax on 2nd properties + higher rates. But they have no guts to do this.. The housing situation is a mess, and will not be solved by a basic income, although once people accept that ‘everybody deserves the means to live’ we might be able to see our way more clearly on this one. Either rent controls or a system of property taxation which penalises speculation on sale prices and rent are all I can see at the moment to provide the kind of immediate relief needed on this front. With the demise of manufacturing, my area in Central London has seen at least a doubling of the total number of private flats (not counting RTB sales on council estates, about 40% of LA property here) while market prices/rents have gone up ten-fold over the last 20 years. This makes me suspicious of the ‘need to build more’ mantra Shelter and the Labour Party keep repeating. Rarely is it heard with the qualification that everything (not just a diminishing proportion) built from now on needs to be truly affordable for the people who keep the city functioning, and those who keep it vibrant. All those people whose wages are going through the floor. Whilst immigration and globalisation play a role, I think long term the main issue will be that the rewards of increases in productivity are kept within a small percentage of the population (generally land and capital owners). Theoretically increasing productivity could be shared by all, and we could all be being worked less hard and having more time to relax. Unfortunately that isn’t the way our society’s ethics are set up. Globalisation makes it worse for a while, but incomes are increasing pretty rapidly across the world, and sooner or later we’ll hit minimum levels where more automation will be cheaper than the cheapest labour. At that point globalisation will stop being an issue. However, unless those benefits of productivity are shared, businesses will lack customers. Somehow we have to leave the idea of people consuming more than they produce – bad, producing more than they consume – good, especially as the two should always be in balance! I wish I knew how we’d get there without passing through breakdown of society on the way. It is interesting to note that activists in China have gone on strike to demand better pay and conditions – and won. This indicates that the labour market today is a global market. Over time, a situation will emerge when labour pay rates will equalise. The one fact which is hard to predict is what will happen in terms of distribution of produced wealth in future. One way of tackling this problem is to evolve away from capitalism towards a new economic system which benefits all. We forget that for a long time the UK was trail blazer we industrialized first, moved from country to towns first, then unionized first which (rightly) drove up wages and conditions for our workers first and, as we were then pretty much the main supplier, our trading partners had to pay our prices. But as other countries industrialized – Japan, Korea then China and India and next Brazil & Africa (which I know is a continent) their plentiful supply of cheap labour will keep world prices down. The reality is if we pay our workers what we now regards as fair our stuff won’t sell on the world market. That situation may change in 50-100 years time as world standards come up but until then the UK’s own lower skilled workers can only be paid what they are worth in world terms.